« More photos of Mamie …. 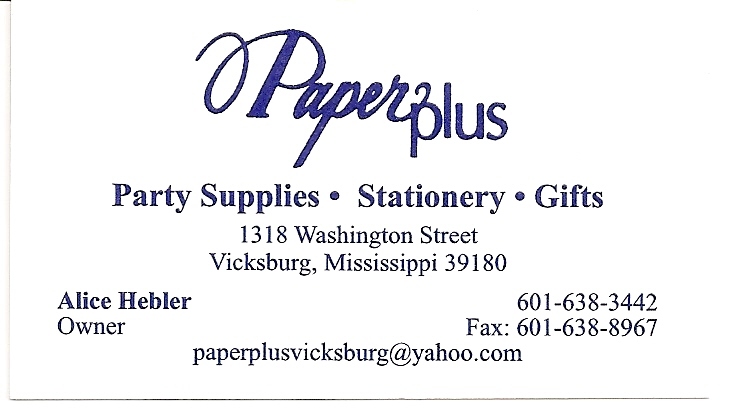 Alice Hebler has invited Denise to sit at her store, Paper Plus, on Washington Street in Vicksburg, Mississippi, this Thursday, November 12, between the hours of 5:00 and 8:00, to sell signed/personalized copies of the cookbook, and keep all the proceeds for my two designated charities. So come by, buy a book, and buy something from Alice too. If you already have a book, still come say hi and buy something from Alice! Order invitations or cards or stationery, or buy some of the cute ones she has in stock. AND Barbara Willingham wants to donate all of the profits from the sales of the book in her shop to the charities too. Aren’t these wonderful ladies? Willingham’s has gifts galore, neat decorating items, Christmas decorations, so many different things. She has such a wide selection, I can’t even describe it. You’ll have to go in and see for yourself. This entry was posted on November 10, 2009 at 10:01 pm and is filed under Cafe Sassone General. You can follow any responses to this entry through the RSS 2.0 feed. You can leave a response, or trackback from your own site.